You might have noticed a game trend on SahmReviews over the past year or so. 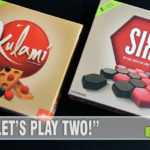 We’ve always professed to have a preference for both abstract games and games that utilize dice. 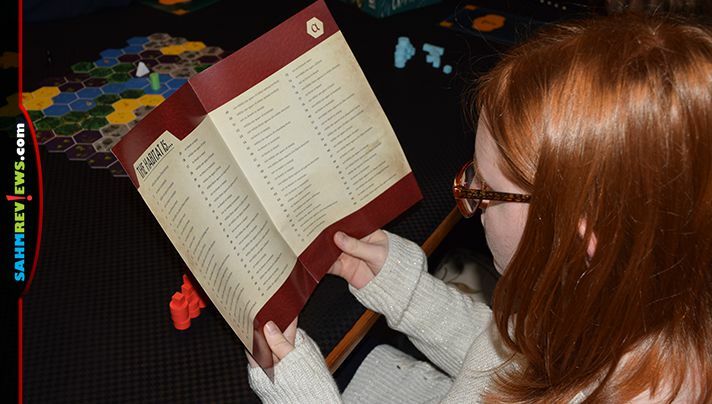 Looking back at the games we played in 2018 and it is obvious there is a third category we haven’t officially revealed our fondness for – games of deduction. The list of great deduction games on the market is ever growing, and we’ve played many of them. Deception: Murder in Hong Kong, Salem, Cursed Court, Alibi, Inkognito, Escape from the Aliens in Outer Space and Alchemists are just the tip of the iceberg. And you can’t forget the entire series of One Night Ultimate Werewolf games! All of these games have one thing in common – you have to deduce a correct answer using only a limited set of information before your opponents do. 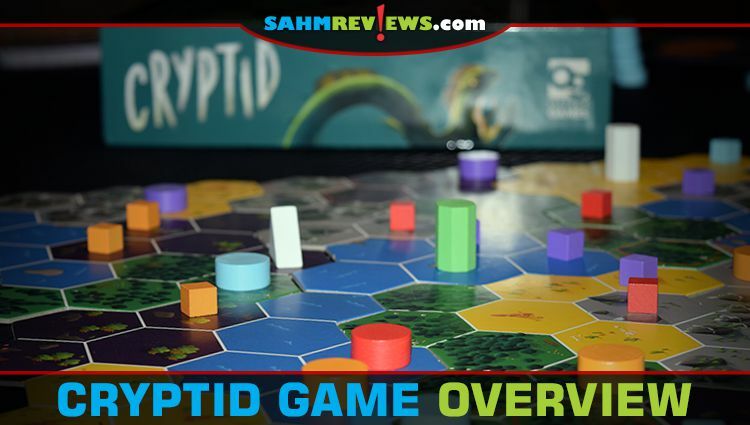 Our latest obsession in this genre is Cryptid by Osprey Games. 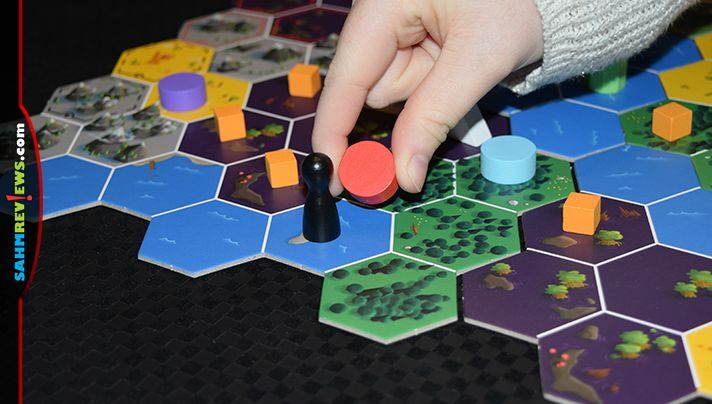 While their previously-mentioned Escape from the Aliens in Outer Space is still a staple in our game bag for when we need to support a large number of players, this new title is perfect for a smaller group who loves to figure out puzzles. The premise behind Cryptid is that all players are cryptozoologists who have already discovered most of the mythical creatures on Earth – sea serpents, yetis, even the Chupacabra! Now you are racing to claim to be the first to uncover the location of a fabled cryptid somewhere in the wilds of North America. 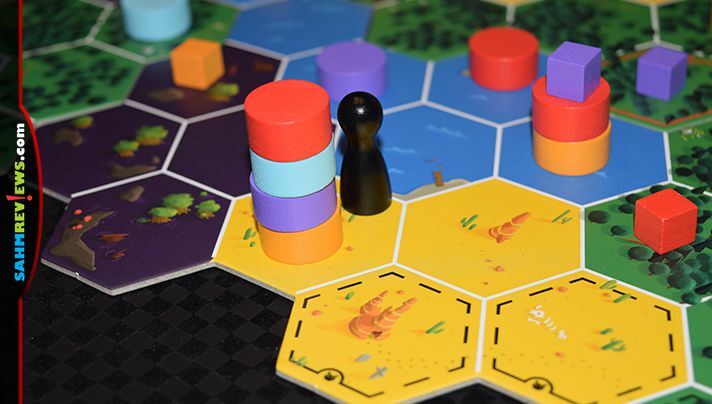 Each player (up to five are supported in Cryptid) is given a matching set of colored cubes and discs and a random clue book with a Greek symbol on the front. After setting up the board, flip the card over to reveal which clue each person will read from their book. These will vary depending upon the number of players and the clue is to be kept secret as it gives critical information on the whereabouts of the Cryptid. In fact, each player receives part of the “puzzle” which will lead them to the one and only spot on the board where the Cryptid lies. Clues might narrow down the type of terrain the Cryptid is on, how close they are to an animal territory or structure or how close they are to a single terrain type. When put together, all of these clues will reveal the exact location of the Cryptid. It is your job to figure them all out. Taking a turn is pretty simple. 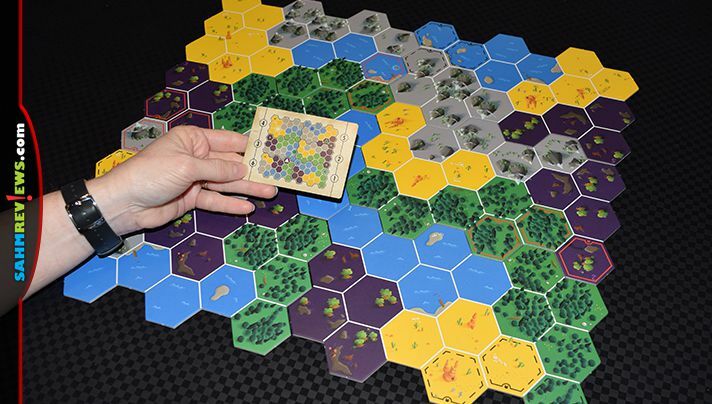 You will grab the included pawn and place it on any hexagon on the map and ask any other player if the Cryptid could be in that location. Using their known clue, they will answer “yes” or “no” on whether it “could” be there. Remember, no one knows exactly where it is and there is no answer key to the game. They can only answer utilizing their own clue! If the Cryptid could be in that location, they will mark the spot with one of their colored discs and then it becomes the next player’s turn. If it could not be there, they will also mark it, but this time with a cube. Once a cube is in a location, no further questions may or need to be asked about that space as the Cryptid definitely cannot be there. As a penalty, if you force an opponent to place a cube on the board as the result of a question, you must also place one of your cubes on a spot where the creature could not be, according to your own clue. This gives additional information to all the other players! 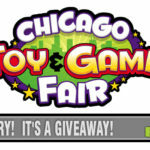 Each person takes turns in clockwise order asking about a location to one other player. You’re trying to figure out what their clue might be by analyzing their answers. Do they know the Cryptid is close to a cougar territory? Do they know it is within one space (or on) a mountain? Once you have successfully figured out a couple of the other players’ clues, you can start to narrow down the few locations the Cryptid might be. Once you think you have it, you can “search” that hexagon area instead of asking a question on your turn. 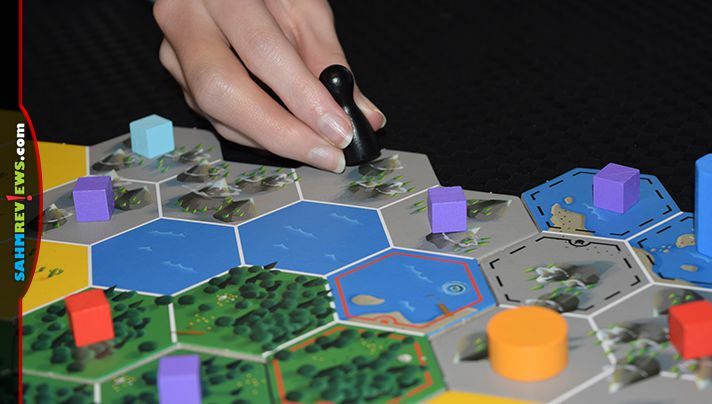 To do so, place the same pawn on the hex and announce you are searching the area by placing one of your own discs on that spot (obviously that spot must agree with your clue). In clockwise order, all other players must then either put their own disc on that space (if it agrees with their clue) or a cube (if it doesn’t). The moment someone puts a cube out on that space, your turn ends and no one else puts out anything further. Additionally, because you forced someone to place a cube out, you must do the same in another space! The first person to search and have all other players place their discs on that spot has discovered the correct location of the Cryptid and wins the game! I have to say, right now this is our favorite deduction game that isn’t also a hidden-role game (like Deception or Werewolf). It’s very challenging to figure out which clues the others have since there are so many possible options. Plus, you’re in a race to determine the Cryptid’s location, so you won’t have the desire to discuss your theories out loud or you might accidentally help them out! And even after you have their clues determined, you still need to figure out which spot on the board works with them all! 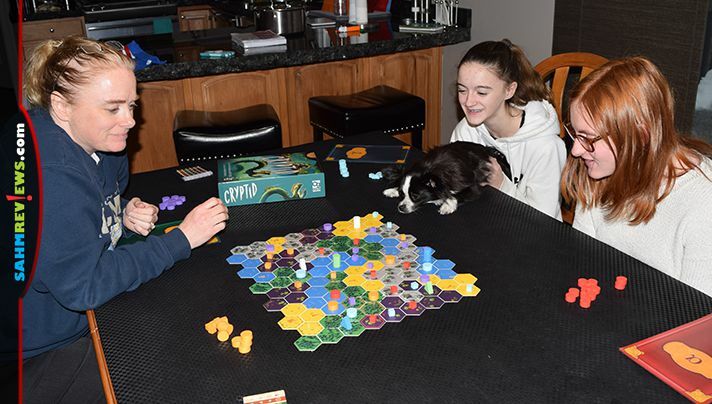 At under $35 on Amazon or at your favorite local game store, Cryptid is a solid purchase for your family game night. Limit the players to ages 10+ as younger ones might not have the analytical skills to determine the Cryptid’s location on their own. If this is an issue for your family, consider playing as groups with one adult and one younger child on each team! Two heads are always better than one! See what’s coming in 2019 from Osprey Games on their website and on their social media channels (Facebook, Twitter). 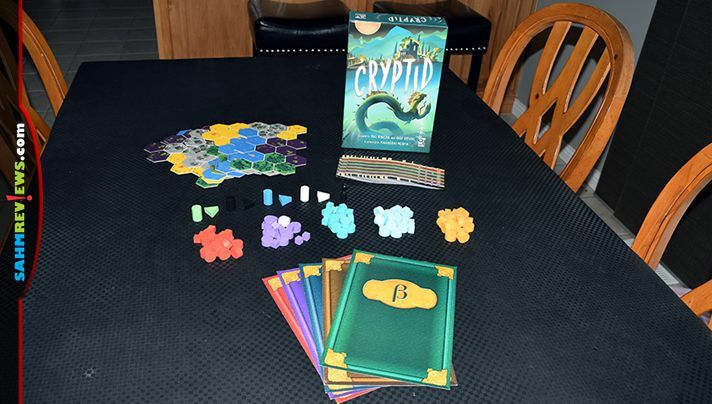 Does Cryptid sound like it would be perfect for your game group but don’t have it in the budget yet? 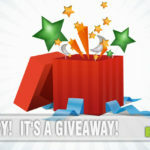 There’s still a week left in our Mega Giveaway where you can win a copy of Cryptid shipped right to your door! What is your favorite deduction game (other than Clue)? Looks like this game has it all! Deduction games are one of my favorite categories. This one looks great! We enjoy Mysterium in our family! I love the opportunity to encourage creativity and imagination with this game….great pick!